We are glad you are visiting us—virtually—today! We invite you to explore our website and discover St. John’s where God’s love is at work. Our church is nestled in the farm country of Carroll County and has a rich history, beautiful surroundings, and most importantly, a wonderful, active church family that warmly welcomes you. If you’re new to St. Johns, our website is designed specifically with you in mind. We’ve designed the site to answer questions that families and individuals looking for a church home would like answered. If you don’t find what you’re looking for on the website, please call us! Come and worship! All are welcome! Worship services are led by Pastor Kristin and members of our congregation. In general, our music is accompanied by the organ, but at times we have special music. In the summer, we have a 9:30am worship service outdoors (pictured here). We celebrate Holy Communion at every service. Current services are held at 8:00am and 10:30am in the church. We have a weekly children¹s sermon at the 10:30am service and encourage children as young as babies in arms to around age eleven to come up and enjoy special time with Pastor Kristin. 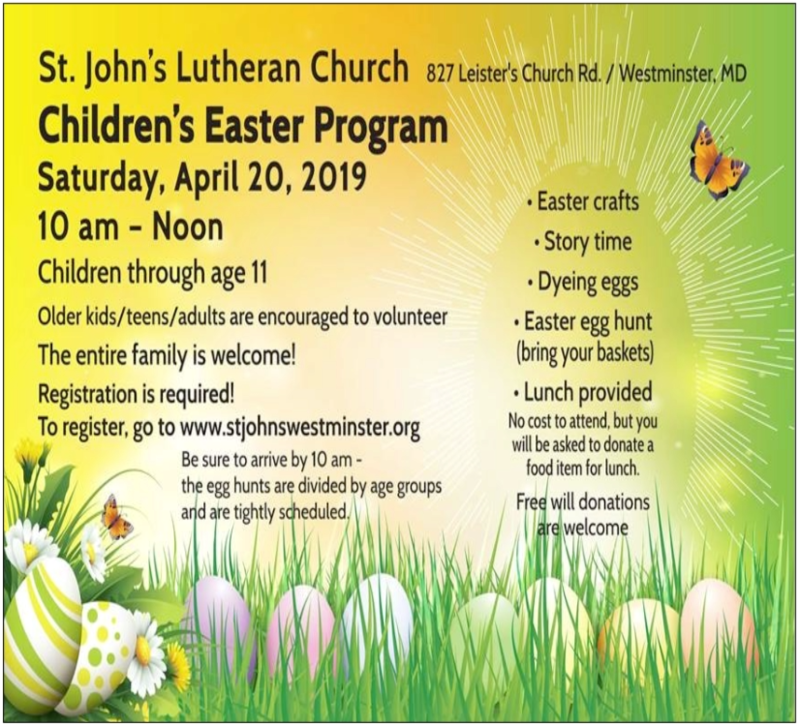 Please join us for our Annual Children's Easter Program. Click here to register! Welcome to St. John's website! If you are looking for something specific and can't find it, please email us at office@stjohnswestminster.org or call us at 410-848-6402!